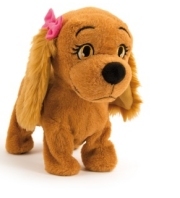 One of the must have toys for Christmas 2013, Lucy the Dog is currently in short supply throughout the UK. We constantly track for stock which ensures you will be the first to know when availability is found. Lucy the Dog is the ideal gift for your daughter (or son) this Christmas. Firstly teach Lucy to recognise your voice by simply saying her name twice, she will then happily respond to a range of twelve commands like bark, sit, dance, search, beg and even give me a kiss! Soft, adorable, cuddly, cute and very obedient, Lucy is very well behaved and you will be friends for life once you have looked into her cute big puppy dog eyes. Recommended for ages 3+ years. Requires 4 x AA batteries. We constantly check for Lucy the Dog stock, so you don't have to. Receive email alerts when Lucy the Dog online stock is found.